This classic 15-inch backgammon set features an ultra plush inlaid velvet playing field, that is so smooth you can barely keep your hands off it. Move your checkers around with ease and enjoyment, while marvelling at how such luxury can be offered at this price. The gorgeous black leatherette exterior is smartly accented with a white double stitching, giving the closed case incredible curb appeal. 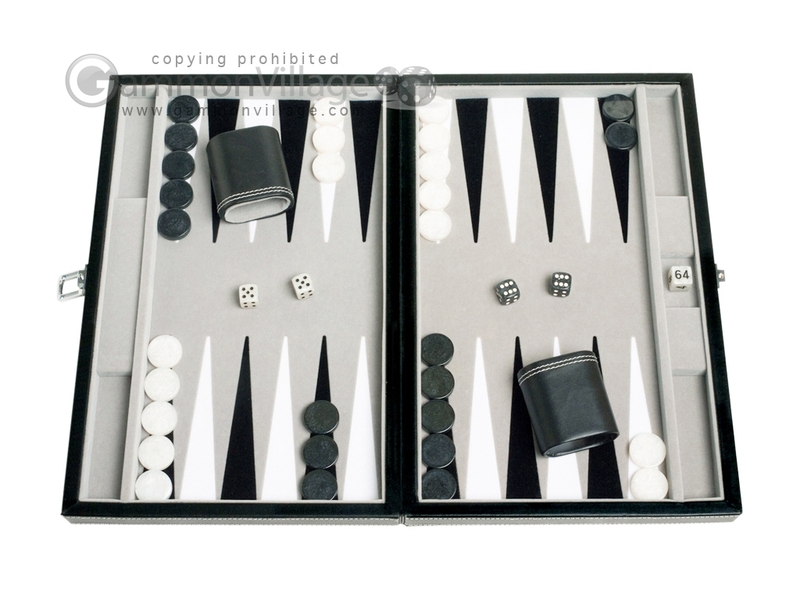 The single nickel latch not only makes this a more travel-friendly backgammon set, it further enhances this visually stunning set. Additionally, the high-gloss checkers, in ghost white and black, come with a beautiful mother-of-pearl design. The matching dice cups are lined with the same velvet as the playing field, and are similarly accented with double stitching. Closed Length: 15" Width: 10" Height: 2 1/4"
Open Length: 15" Width: 20" Height: 1 1/8"
Cup Height: 2 5/8" Width: 1 1/2" Length: 2 1/2"
Page P4668 Copyright © 1999-2019 GammonVillage Inc., USA. All rights reserved.